Sr. Joan met Fr. Kakuba at Bristol University where she was a lecturer and he was completing an MA in Theology as a mature student. When Fr. Kakuba returned to Uganda in 1983, the ongoing war meant communication was more or less non-existent; but he and Sr Joan stayed in touch, and in 1986, when fighting ceased, Fr. Kakuba asked Sr. Joan to help him rebuild the area around Kanyike where he had grown up. She agreed and visited the villages in 1988. The Kanyike Project was born! Her role at this stage - initially for three years - was simply to raise about £300 p.a. to fund what Fr. Kakuba, the Project Co-ordinator and the village community saw as important. As time went on, the Kanyike Project became recognised officially by the District Local Council and Sr Joan became Overseas Director of the Project. In September 2001 It became an NGO (Non-Government Organisation) in Uganda (comparable to a Registered Charity in the UK.) 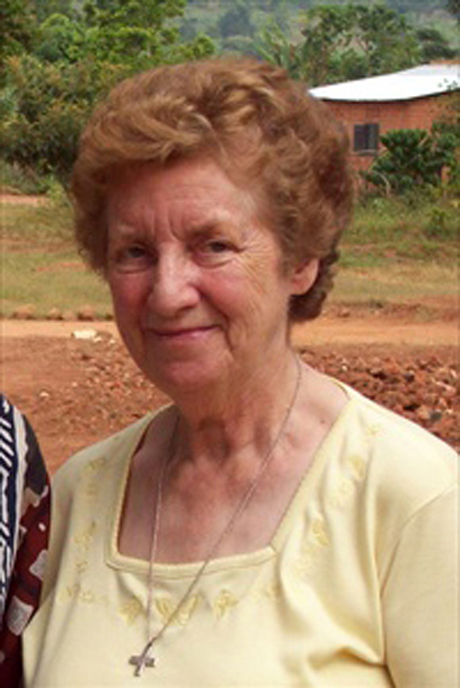 Sr. Joan became a Trustee of the Project known in Uganda as KAINSUDE (Kanyike Initiative for Sustainable Development). A Ugandan Board of Trustees was set up with Fr. Kakuba as CEO. Sr. Joan now needs to raise at least £60,000 per year and work hard to maintain contact with all our valued supporters. Since her first visit to Uganda in the '80s, Sr Joan has spent at least five weeks in the villages every two years. Her initial three year promise has extended to become a commitment which has lasted for more than 20 years!